Will Google eBooks Save Indie Booksellers? 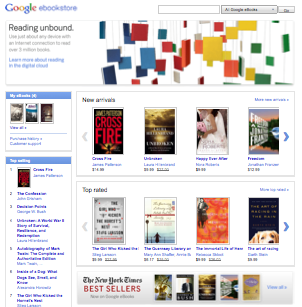 The Google eBookstore launched today in the USA to much chatter and speculation about how it will change the e-book market. One of the major changes that the Google eBookstore brings is its open platform that allows partner and affiliate retailers to sell Google eBooks. Through an agreement with the American Booksellers Association (ABA) and agreements with indie bookstores, Google could enable brick-and-mortar bookstores to swiftly enter the e-book arena. Can Google eBooks save independent brick-and-mortar bookstores like Northern Lights? Many small bookstores do not have the staff or resources to build their own e-book platforms. Presumably, Google will make it as easy as possible for booksellers to integrate Google eBooks into their websites. With access to over three million titles in the Google system, a variety of e-book formats, and compatibility with most of the e-reading devices out there, independent bookstores have a powerful platform available to them. Without having to concentrate on the technical details of selling e-books, indies can focus on their “bread-and-butter” services like curation and personal book recommendations. As of the launch today, Google has partnered with Powell’s Books, an independent with a strong online presence, as well as users of the ABA’s bookselling platform. (Alibris is also selling Google eBooks, which is interesting because they are an online-only store. Google’s partner retail model could also bring an explosion of online-only independent booksellers, but that is another topic.) It will be interesting to see how Google integrates with smaller websites and how fast other independent booksellers adopt this system. Any independent booksellers out there? What do you think of Google eBooks? Will you use it? Let us know in the comments!